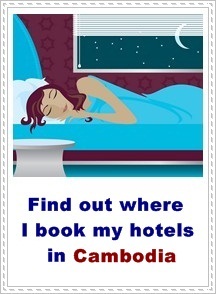 Finding cheap accommodation in Battambang is effortless. It's not as touristy as Siem Reap, so the prices on accommodation are still low. Choose between guesthouses and hotels along Street 3, or in the side streets of Street 3. You usually get what you pay for. Low-priced rooms have a plain bed with fan and cold showers. Here are the budget hotels I stayed at while I was in Battambang, and some other recommendations. Royal was said to be cleaner and much friendlier than Chaya Hotel. And it was. Indulge yourself in large rooms with TV and hot water. They also have a roof top restaurant where they serve breakfast, like baguettes and omelettes. You should try their delicious fruit drinks! The staff at Royal are known to be very friendly and welcoming. As a service, they arrange tours around Battambang and bus transportation. Chhaya Hotel is popular with backpackers because of the cheap rooms. For $ 5 a night, I couldn't really complain: Hot showers and a fan to cool off. Staff was friendly and accommodation - they arranged me a bike and a driver for a day trip to Wat Banan and Phnom Sampeau, which was successful. But on the other hand, my room wasn't clean. They apparently forgot to vacuum clean, so there was dust and sand on the floor when I arrived the first day. For $5 the value is OK, but will probably stay another place the next time I'm visiting Battambang (because I want cleaner rooms). This is the perfect place for rock-bottom budget backpackers! Chhaya also offers newer apartments at $ 15-25 per night - a nicer option for flashpackers. Didn't find what you were looking for? You might check out these other options below. Click on the link to read reviews at Tripadvisor.